The Black Eyed Peas said it best with: Pump It! More and more games are making the transition from mobile markets to the console market. There seems to be a demand for smaller, less expensive games that have some good, strong gaming mechanics to them to offset the more expensive triple A titles. 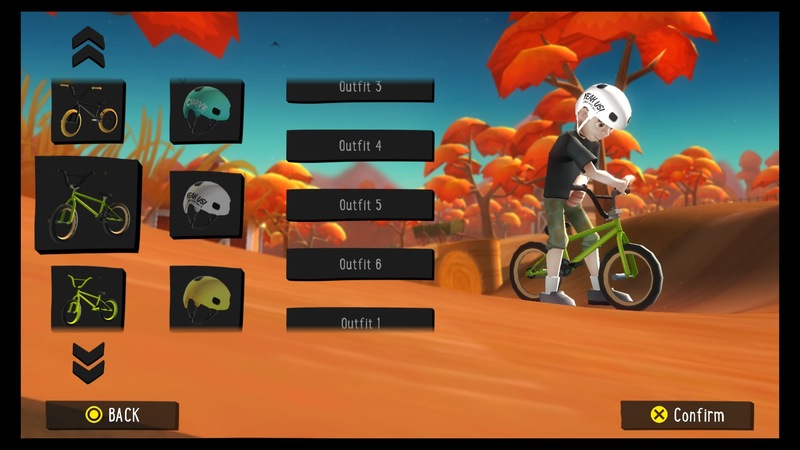 Developers Yeah Us have decided to jump in on this market opening and bring their title Pumped BMX+ to the PlayStation platforms. I’ve always been a fan of games such as Tony Hawk, Matt Hoffman and Dave Mirra titles so any BMX or skateboarding game always piques my interest. After seeing the trailer for Pumped BMX+ I had to see what it was like. Now I never played the IOS and Android game that this titles takes ‘inspiration’ as its put in the press release. 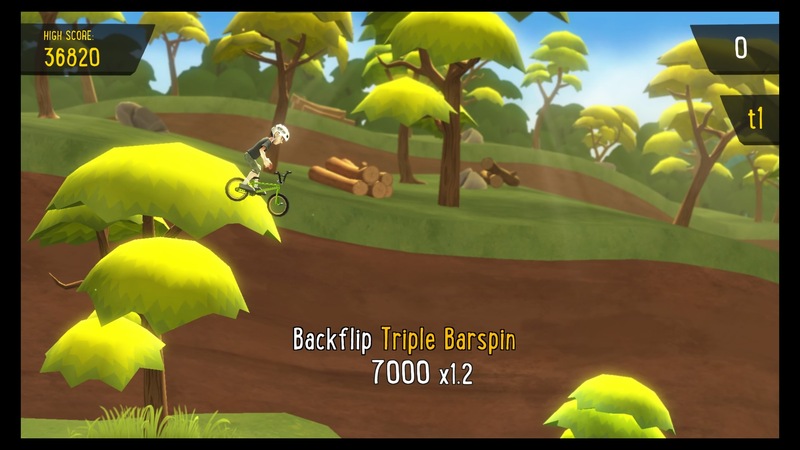 With a name like Pumped BMX 2 I would imagine it takes a lot of inspiration but without playing it I can’t be sure. Going into this I wanted to see if it really would be a game that could hold its own amongst other smaller titles on the PlayStation let along amongst other sporty bike titles. The obvious comparison that will probably be made initially is that to the Trials games one mobile. I can tell you now that its nothing like them. Yes its a linear track game and you control the bike to make it to the end of each level but that’s where it ends. Pumped BMX+ has a unique and distinct control design which makes it stand out. As the game title says, it’s all about the pump. For those that don’t know what this is I’ll try to explain. When you ride you can increase momentum and there for distance and height in jumps and landings by timing when you execute the take off and when you prepare and execute the landing. In real life this is done by weight shifting to the front and rear of the bike to give it that extra ‘pump’ where as in the game its done by use of the X button and by accurately timing when to launch and to set the landings. Sounds fairly simple right? Has to be you would think for a small indie title that comes from a mobile game yes? Nope! this takes some serious practice and skill to get some of the later levels dialled in. Some of the jumps are so far apart and so high that you think there is no way you will make that distance. Try as you might you just cant hit that mark until you remember what the game is called and this important mechanic. By timing your first jump correctly and by landing the jump as close to the top of the landing ramp as you can and then releasing right at the last second on the exit of the next jump you can gain huge increases in both height and length of your jumps. Concentration and practice is certainly needed for this. Not too tricky to master if that’s all you have to do, but wait, there’s more to do on a level than just getting to the end! Tricks are where any good BMX game makes its mark and it’s really nice to see that Yeah Us have put in all manner of tricks as well as the ability to make some insane combos! I wouldn’t be surprised at all if one or more of their team rode at some point in their lives. The tricks are well presented and they flow well when combining tricks. They are pulled off by using the right analogue stick to pick specific tricks as well as the R1 button to switch between two sets of tricks, one set being more difficult than the other. This can also be combined with rotations and spins giving the player a huge amount of creativity and options when it comes to performing tricks. One thing I found slightly troublesome was the fact that you only have to move the analogue stick in whichever direction once to perform the desired trick. If you keep the stick pointed in the direction then it automatically performs multiple versions of that trick which can cause real problems when trying to land mid trick. Why is this a problem? 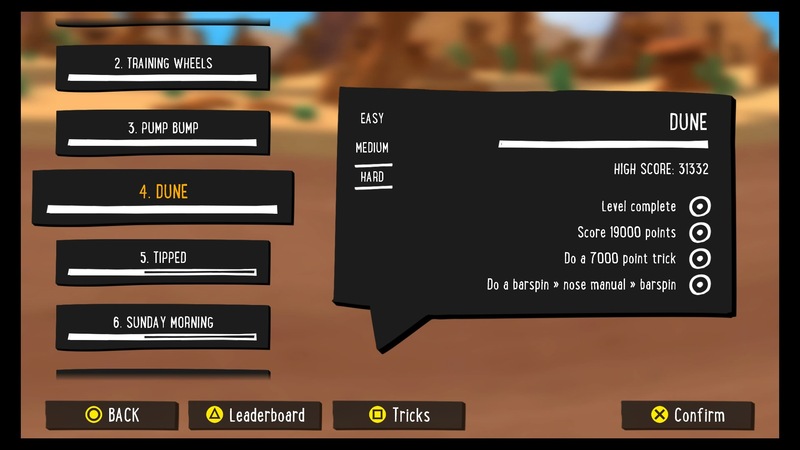 Well, it’s not in regards to Pumped BMX+ but as a gamer that has put hundreds of hours into other bike and trick based games, muscle memory causes a problem that needs to be re worked. A problem for me and not the game. I found myself hitting the floor while doing triple bar spins when I only wanted to do a double barspin. This will just take some getting used to as the game mechanic itself is solid and very responsive. Graphically, the game looks good, it uses a colour palate which you tend to see in many mobile games. Being created with the Unity Engine might explain this as well. The rider and bike are clean and crisp. Details aren’t exactly high on the menu here with no names or brands or graphics on the bikes and the rider has rather a generic look to itself. That said though, the bikes are nicely detailed and look good throughout the levels and tricks. You can change the colour of the bike and the outfit and helmet of the rider. Nice in itself but nothing gained in overall feel for the game here. A bike customiser might have been a nice addition. The overall look of the game is solid and looks fine on the Vita although on a big screen using the PS3 or Ps4 it possibly feels like you could have given the game something more. The aim of each level is to complete each of the 4 set tasks. These can be an assortment of challenges such as hitting a high score, completing a score for one trick, performing one trick etc. These are only successful on completing the level so don’t be expecting to suicidal fly off a ramp perform the trick and not worry about the landing. Each level has its easy, normal and hard sets of challenges to complete. Once done that level is 100%. With around 8 tracks per section and 5 sections to complete, each harder and more technical than the last. This mechanic makes for addictive gameplay as it has you trying continuously on one track to complete all the set challenges. Add to that besting your high score and you have a fun, playable game. The pumping mechanic is what makes this game challenging. The simple fact that once you have made your first jump, you can no longer pedal to gain speed makes pumping the ramps and jumps of utmost importance. For some this will take some getting used to as I can’t think of another game of this type where the pumping of the bike has been as of high a performance. The closest I can think is Trials Fusion on the PS4 but even there, you have an engine to gain speed between sections and if you make mistakes. In Pumped BMX+ a mistake can easily mean restarting the level. You will find yourself concentrating intently on when and where to take off and land that making that huge step up gap jump and landing it feels like an achievement on its own let along pulling tricks in between. Overall: I really enjoyed this game. Admittedly it’s a genre I already enjoy but that in itself could work against it if it was bad or broken. I can happily state that this is a solid, very playable game. The scorechase aspect alone will have you coming back to play and the solid way it performs tricks gives a nice feeling when you can finally pull off that 720 double backflip Turn down to tailwhip manual! In that respect it has that feel that the likes of Tony Hawk Pro Skater gave when you landed your intended combo. High regard indeed. The Pumping aspect of the game is probably the hardest thing to get used to as it’s not been as big a factor in other similar titles yet here it is of utmost importance. Nail it and you will complete the level. Fail it and you will be retrying the same level 20- 30 times before it sinks in. Price wise I think it may be slightly over priced. I think that a price point of £4.99 would have been perfect. If there was a second part to the game such as co-op, or a track builder or online head to heads then I would be comfortable with the £7.99 price. 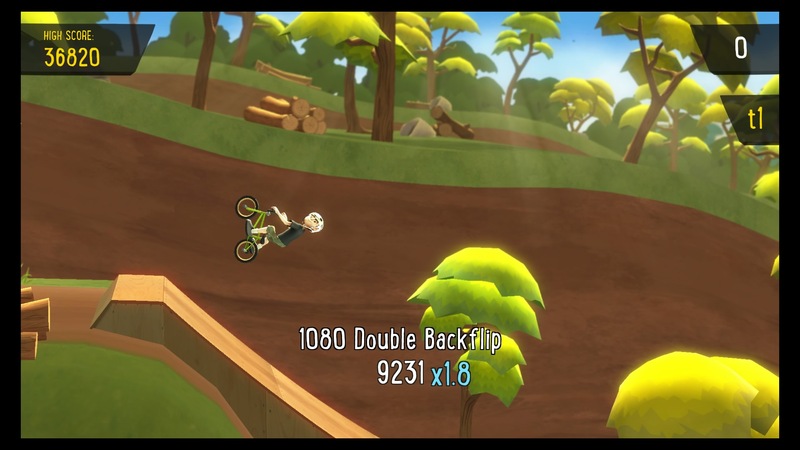 That said, I can’t argue the fact that there is a lot of playability in Pumped BMX+. Completing each level and hitting those high scores is certainly fun and makes for a great game that can take on titles from much more established developers. Add to this that the PlayStation versions are crossbuy so in fact you get three games for the price of one makes it much more appealing. 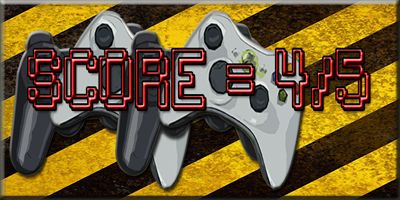 Game Code supplied by Curve Digital.